Beelzebub is the king of demons, the ruler of Hell, the prince of darkness, the true personal identity of the being most people call The Devil or Satan. You see there’s Satan, which is more of a title, and then there’s Beelzebub, a literal prince of demons. 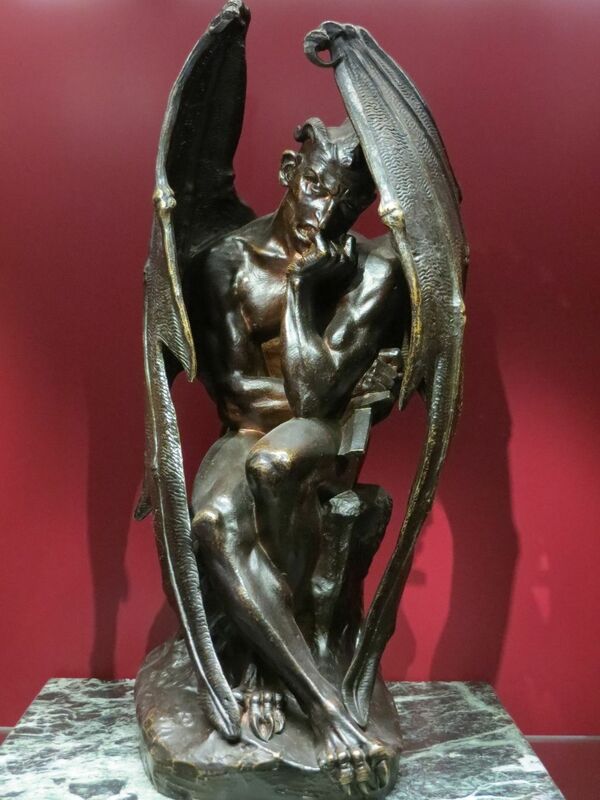 In the context of Satanism, Satan would refer not to any kind of literal devil, but to the individual who seizes the gift of selfhood and walks the individualistic path fulfilling his/her own personal goals and desires without acquiescence to any higher power, that’s what a Satanic path is all about and it is where any belief system such as Satanism or Luciferianism would begin. Anyways, because of his status as the prince of darkness, Beelzebub is the lord of the dark side of the force, the lord of material pleasures, a symbol of all the things brought forth from the underworld, the demonic regions of human nature, and the demons and dark forces that interest me. In this capacity, he’s also associated with pride, gluttony, greed, indeed all the things associated with the devilish aspect of the human mind. And he’s not just the lord of dark desires, power, ambitions, and drives, he is the deity of the pursuit of these things, and their attainment. Beelzebub is the kind of deity, or rather demon lord, who encourages you to plunge into the pool of chaos, long for the power of darkness, and reap its rewards. In his capacity as the ruler of demons, he rules over the darkly chaotic powers of the desert wilderness. In Biblical times, the wilderness was considered a hostile place of chaos filled with demons, ready to pounce on or tempt any who dare to traverse. I suppose this makes some sense when you consider that wilderness we’re dealing with is a desert. And if you lived in the Middle East in those days, the desert would have been considered a place of hostility and death. In a way strange way, Beelzebub doesn’t just represent the power of demons, he is the master of the demons, and so he masters the forces of the wilderness. Beelzebub being the ruler of the demons of the desert, as described in the Bible, kind of reminds me of the Egyptian deity Set, who was a deity associated with chaos and the desert and was the master of the forces of discord. The name Beelzebub comes from the name of a deity attested to in the Hebrew Bible called Baal-Zebub (or Baal Zebul). He was a deity worshiped by the Philistines at the city of Ekron, located somewhere in what is now Israel. According to the Book of Kings (2), the Israelite king Ahaziah sent oracles and messengers to this deity after recovering from a fall, but the prophet Elijah stopped them, condemned Ahaziah for seeking aid from a deity other than the national deity of Israel (Yahweh/Jehovah), and proclaimed he would never rise from his bed. The name Baal-Zebub means “lord of the flies”, but it may have been intended to be a pun on the name Baal-Zebul, which means “lord of the high place”, and such a pun might have been intended as a way of mocking or slandering the followers of the cult of Baal by referring to their deity as dung and their followers as flies. In those days, Baal’s cult was prominent in the lands of the Levant, and it was a prominent rival to the cult of Jehovah practiced by the Israelites. Baal came in many forms for different cities and with slightly different attributes. The deity popularly known as Baal was most likely, in actuality, a deity named Hadad, a deity of storms, rain, and fertility. The cult of Baal was even brought to Egypt by a people referred to as the Hyksos, who ruled Egypt under their own dynasty between 1603 and 1521 BCE. In Egypt, Baal (Hadad) was equated with the Egyptian deity Set, who was the deity of storms, the desert, war, and foreigners, and it turned the two deities had a lot in common in terms of their mythological attributes, so Baal became identified with Set and eventually a new cult formed devoted to a hybrid deity named Set-Baal (or Baal-Set). After the Hyksos were driven out of Egypt, they became vilified by the Egyptians, and so was the Egyptian deity Set, having been associated with foreigners and thus becoming associated with the foreign rulers they came to despise, and Set now came to be seen as the evil deity to be vanquished by Horus. In the New Testament, Beelzebub is identified as the prince of demons, and Jesus’ detractors had accused him of performing his famous miracles and exorcisms by the power of Beelzebub rather than through Jehovah. In those days, it may have been believed that only the prince of demons can control demons. Beelzebub clearly was considered the prince of demons, and this is the source of the Christian conception of Satan as the lord of “evil” spirits and the ruler of the underworld. In the Jewish faith, the term Satan didn’t refer to any specific entity. It simply meant “adversary”, and this could refer to anyone; human or angel, or anything else. It was only when Christianity rose to prominence that Satan came to be identified as a specific being, and that being is Beelzebub. In the Testament of Solomon (which scholars aren’t sure was written before or after Christianity), Beelzebub appears as the ruler and leader of the demons and an angel who fell from heaven. He claims to lead men into worshiping demons, bring destruction through tyrants, arouse lust in priests, cause jealousy, and instigate wars and murders, and he tells Solomon that he lives in the evening star or Venus. Beelzebub tends to get a very high rank in the hierarchy of Hell in the Christian tradition demonology, and was presented in many different ways by occultists, theologians, demonologists, and other figures. He is commonly associated with gluttony as one of the seven deadly sins, as classified by Peter Binsfeld, while the exorcist Sebastien Michaelis associates Beelzebub with pride. Michaelis also places Beelzebub among the three most prominent fallen angels, the other two being Lucifer and Leviathan. The poet John Milton describes him as a fallen cherubim who was imposing and had a wise face. Colin DePlancy described him as the god of the Canaanites, who represented him as a fly, an idea which likely goes back to the age of the Israelites. DePlancy also states that he was known to give oracles, just as Baal-Zebul of Ekron was originally believed to do so, and that he can rid harvests of flies. In the stories Johann Weyer, Beelzebub is Lucifer’s chief lieutenant who led a successful revolt against the Devil. The Sacred Magic of Abramelin the Mage states that Beelzebub has the power to change men into animals and vice versa. In medieval times, Beelzebub was believed to be a demon of great power, who sorcerers conjured at risk of death by apoplexy or strangulation. The demon was difficult to banish and when summoned he would appear as a gigantic fly. Beelzebub was also believed to reign highest of the demons of the Black Mass, and to preside over the Sabbaths and black masses of witches, where they would deny Jesus in his name, chant as they dance, and even copulate with Beelzebub in wild orgies. Beelzebub is also one of thousands of demons blamed for the possessions that took place at the French province of Aix-en in 1611, which involved a nun named Sister Madeleine de Demandolx de la Palud. Beelzebub is considered to be the chief of all false gods, the governor of Hell, the prime minister of the infernal forces, the chief of staff under the Devil, among many other ranks and titles. Some demonographers consider him to be the chief of Hell itself. He is traditionally depicted as either a giant fly or a being with noticeable fly features, but many grimoires have very different depictions of him. Some depict him as having the appearance of a misshapen calf, a goat with a long tail, a snake with feminine features, among various other descriptions. Reynnier Gustave describes Beelzebub in the De Marcelli Palingenii Stellati poetae Zodiaco as a spirit who is exceedingly tall, with a large and puffed out chest, a swollen face, menacing eyes and eyebrows, exceptionally large nostrils, bat wings, webbed duck feet, and a body covered in black fur, and with a crown of fire hovering around his head where two large horns protrude. Nowadays, Beelzebub and Satan are considered synonymous, but at the same time they are somehow treated as different beings, and Beelzebub is usually treated as “that demon who looks like a fly”.